One day last summer, I was driving home with my iPod plugged in when Bobby Goldsboro’s version of Watching Scotty Grow cued up. Watching Scotty Grow was the first record I ever owned, given to me by my parents when I was three or four. It’s the perfect anthem for any father and son, but I was sure that this was a song about me. The pride in the singer’s voice symbolized how my dad felt, watching his Scotty grow, and it made me happy whenever I played it on my Mickey Mouse record player. The song sometimes gives me a brief, pleasant flashback, but never anything deeper than that. Not until last summer. On that summer afternoon, I was in the midst of a difficult month. I was under a lot of stress and had too many things playing on my mind. Any one of 5,000 songs might have come next, but it was Bobby Goldsboro. His words threw me back to my childhood harder than ever before. I flashed back to the morning, four years after I wore out the grooves on my first record, when I woke up to a house filled with crying siblings. My mother sat my little brother and I down on the couch, an arm around each. “Last night, Daddy got very sick, and he died,” she told us. She said more, but that’s all I remember. The next thing I remember was lying on my bed, staring at the wall. I have no recollection of what an eight-year-old thinks at such a time. Maybe we’re not supposed to hang on to those thoughts. My memories of him are faded and frayed around the edges. Comparing these dim memories to the people his children grew to be, I know there is a gap in them. I recall the man who walked fast toward serious business so that the farm work would be done before the day ran out. I was too young to appreciate the humor and subtle tenderness for his family that lay beneath. It occurred to me that my father wasn’t much older than I am now, the night he went to sleep and never woke up. There is so much left to do with my children. I want them to know who their father is, beyond the two dimensions of knowledge that distant memories give. My father certainly wanted that too, but his wish was cut short. That’s when my grown-man blubbering began. I struggled against the tears as I considered the terrible fate of leaving children with only faded memories. I’m not sure if I wept over my own fears or for my father’s reality. Both, probably. I’ve never wondered who I am, nor felt the need to go in search of myself. Perhaps this means I knew my father better than I remember. 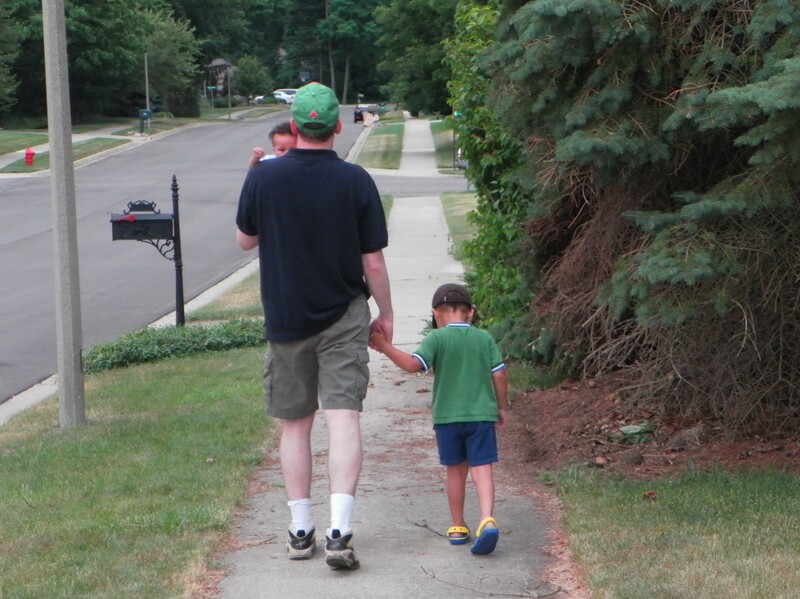 When I walk with a purposeful gait because things need doing, I am my father’s son. So too, when I laugh with my boys. I composed myself before going into the house. I didn’t want my family see me like this. It would be better to spend this day smiling and laughing with them than crying over past events and future fears we couldn’t do much to change. There are things, beyond memories, that a father gives his children. Sometimes, it takes the children many years to realize them. Lucky kids are given the capacity to always keep growing. I like to think my father is someplace where he can see how lucky I was – he and God watching Scotty grow. On this Father’s Day, I wish all dads plenty more time to watch their children grow. This entry was posted in Holiday Hijinks and tagged Dads, family, fatherhood, Fathers Day, kids, legacies, memory, Sons. What a great post. Sorry you lost your dad so young, that’s really tough. My dad’s family dies young, so at 64, he thinks everyday is a miracle. I mostly roll my eyes at him because he’s still young and healthy, but on some level, he’s right. From time to time, I worry about dying suddenly too. I wouldn’t really care, but for my young kids. I’m going to hug them extra hard tonight, for your dad. Thanks, Don. And be sure to give your dad a big hug this weekend too. I’ve been home with the boys the last couple days; during every spilled juice incident and every pointless fight, I’m trying to use the “every day is a miracle” philosophy to give me perspective. That’s really sweet. I’m so sorry about your Dad– but that was a lovely post. Thank you. I’m sorry about him too. I wish he could have seen who his children became. I’m so sorry for your loss. I’m sure your father is very proud of the man and dad you have become. Yeah, it was kind of a dirty trick keeping it all serious. Holidays (Is Father’s Day an actual Holiday?) do that to me sometimes. Thanks for the kind words. From some of the things you told me when we worked together, I always assumed your father was a man with a remarkable work ethic. A trait he passed on to you. Happy Fathers Day, there is no substitute for a great Dad! Thanks, Tom. I only wish my work ethic could be so focused on practical and necessary things. Mine goes after pie in the sky sometimes, and I’m not even sure there is any pie up there. A lovely and heartfelt post, Scott. I lost my dad last year the day after Father’s Day, so this year is a bit of a double whammy. But I know that I will remember the positive along with the sad. Thanks for sharing. I can see how this might be a tough time for you, Traci. But I’m sure your dad is somewhere feeling very proud of you for all difference you make in kids’ lives. This a such a heartfelt post. It seems every time you write about your father its drenched in great memories. Thanks, Pieter. I only wish I had more memories to write about. The ones you do have is beyond precious my friend. Lovely writing, Scott. My father died in an accident when I was 8 years old. At 20, I went to see a counselor who asked about my father. “He’s dead,” I said and burst out crying. It was as if I had just heard the news of his death. That 8-year-old stays with you and pops up every now and again to remind you of how incompletely 8-year-olds deal with things the first time around. But maybe it’s a good thing to re-cry a child’s tears every once in a while. Definitely one of your most memorable posts to date (and of course it makes me think about the one you wrote recently that dealt with the passing of your mother). I was particularly struck by the phrase “I knew my father better than I remember.” I guess that shows that in the short time he was such an essential part of your life, he has become an essential part of you for the duration of your entire life, and also a part of your sons’ lives I think. There’s not much sense to be made as to why stuff like your father’s death happened when it did, but I too embrace the sentiment that, even though someone is no longer with us, that person shall remain a part of us. The very act of thinking about someone (or publishing a post like this) in my opinion keeps that someone alive. Like your sons, I never knew my grandfather, but I heard a distinct echo of him in my mother and each one of her brothers and sisters. It took me months to write this essay, and I still wasn’t satisfied with it, but I thought Father’s Day was an appropriate time to post it. I’m glad I did, because it made me feel better about my own kids. I realized that it doesn’t take long for a father to leave his children with a strong set of values if the father lives those values every day in everything he does. Core values don’t fade so fast as memories do. That was a happy discovery. I’m not a father, but I think that sums up the perfect sentiment in this regard, indeed very appropriate for Father’s Day.